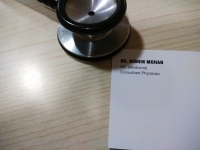 I work as a general medicine and internal medicine consultant in a multi speciality hospital with more then 500 beds handle a variety of complicated cases which require multi system tertiary care. Experience of 8 years after MD medicine.I have also completed my fellowship in geriatrics. – Gab****, Paterson, United States. – Hem*** Jain, Gwalior, India. "Thank u Dr. for ur precious comment ..."